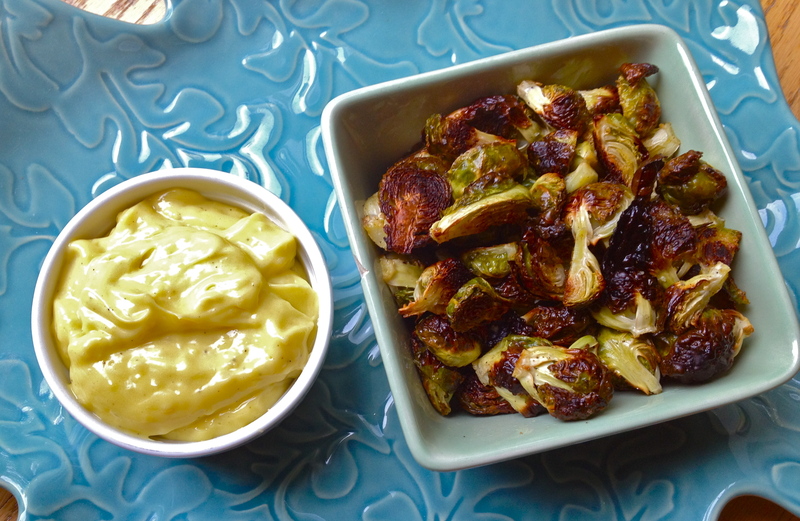 Roasted Brussels Sprouts and Homemade Garlic Mayonnaise. There are certain recipes that all chefs should know how to prepare. Some are grand and time-consuming, like coq au vin or borsch, and others are simple and versatile, like cream scones or chicken stock. Often these types of recipes are all about getting the technique right, which can be much more difficult than it sounds. I always have a couple of difficult recipes that I’m working on, trying a few times to make sure I’ve got them right before I post anything about them. Luckily for me, homemade mayo was one I got right the first time! It takes a strong arm, a steady hand, and a good eye, but it really isn’t so difficult when you get down to it. A whisk here, a few drops there, followed by a bit of frantic whisking-while-pouring, and you’ve got yourself a beautiful homemade mayonnaise. Crispy golden brown Brussels sprouts are the perfect accompaniment to this garlic mayo, but you’ll definitely have some leftovers on you hands, so go crazy and mayonnaise it up while you’ve got this beautiful fresh stuff around. Chicken salad sandwiches maybe? Or BLTs spread with a generous glob of mayo on perfectly toasted wheat bread? If there ever were a time to be glamorous and indulgent with your food, it’s when you’ve got access to your own homemade mayonnaise. 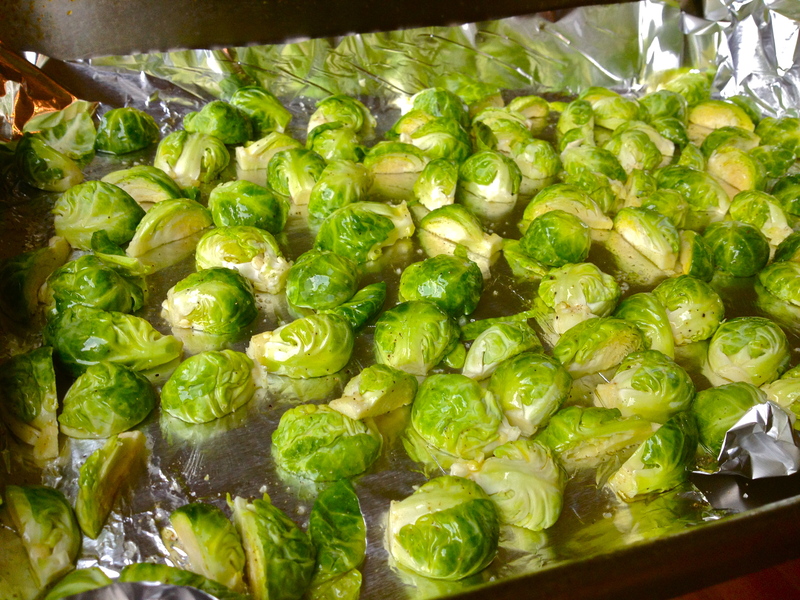 Toss Brussels sprouts with olive oil, salt, and pepper, and spread in a single layer on a foil-lined pan. Bake until slightly crispy and browned. While the Brussels sprouts cook, mix up the mayo. 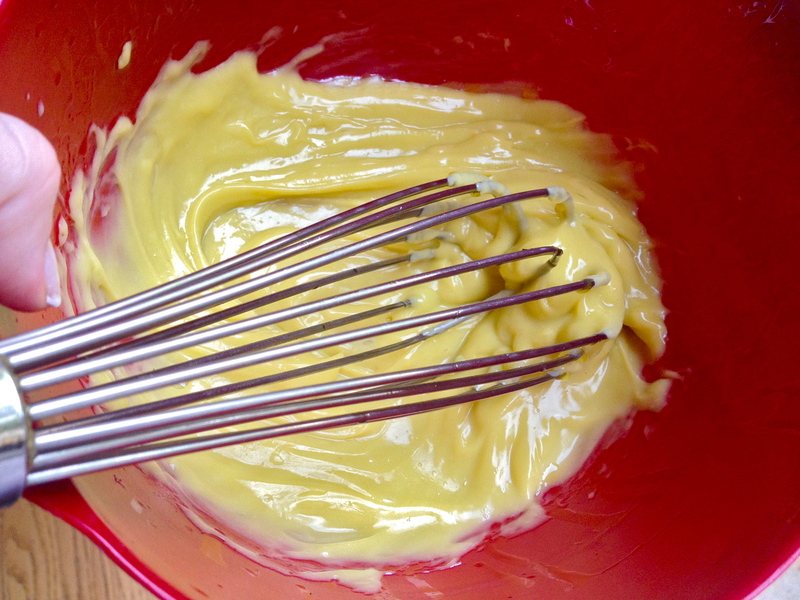 Whisk together egg yolk, vinegar, and mustard. Whisking constantly, add a few tiny drops of the oil mixture at a time until the mixture emulsifies. 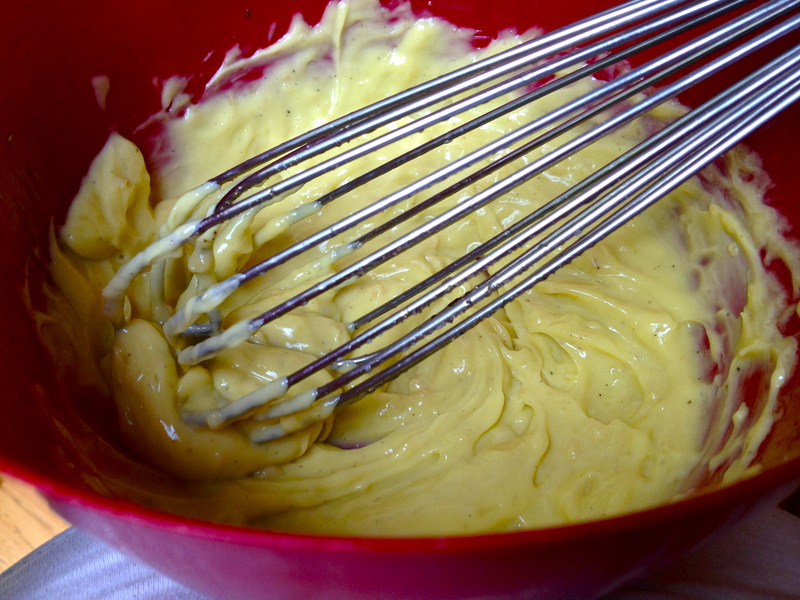 Add the rest of the oil in a steady stream until it’s all incorporated into a smooth, pale yellow mayo. At this point, whisk in the lemon juice, salt, pepper, and garlic. That’s all! Scoop the mayo into a ramekin and serve it as is, at room temperature, or cool it off in the fridge for a while. Serve as a dip with the hot Brussels sprouts. You’ll have a lot of mayo leftover, so do something amazing with it (it won’t last as long as preservative-y store-bought mayo so use it up quick!). Next Silent Black Bean and Chorizo Soup. I love Brussels Sprouts and I never thought to serve them with mayo. Thanks for the inspiration. I’m really glad to see your instructions for the homemade mayo. All of the recipes I’ve seen use either a food processor or an immersion blender, neither of which I can afford right now. It’s great to see that with a little bit of “frantic whisking-while-pouring” good homemade mayo can be accomplished! I’ll have to try this next time I want to have picnic sandwiches. I’m in the same boat you are! I often comfort myself, in my cheap low-tech kitchen, with the thought that most of the recipes I’m making were created before the days of Kitchenaid, so my old-fashioned method food probably turns out much, much more authentic. My sore-from-whisking arms usually disagree. The vinegar acid in the recipe plus what is in the prepared mustard will cook the egg so you don’t have to worry about blab, blab, blab. LOL I just liked your warning. That was cute. It does sound good.